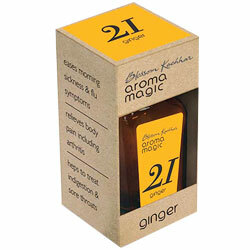 Aromamagic Ginger Oil - Treats Indigestion & Sore Throats, Eases Morning Sickness & Flu Symptoms. Treats Indigestion & Sore Throats. Relieves body pain including arthritis. Helps to treat indigestion and sore throats.